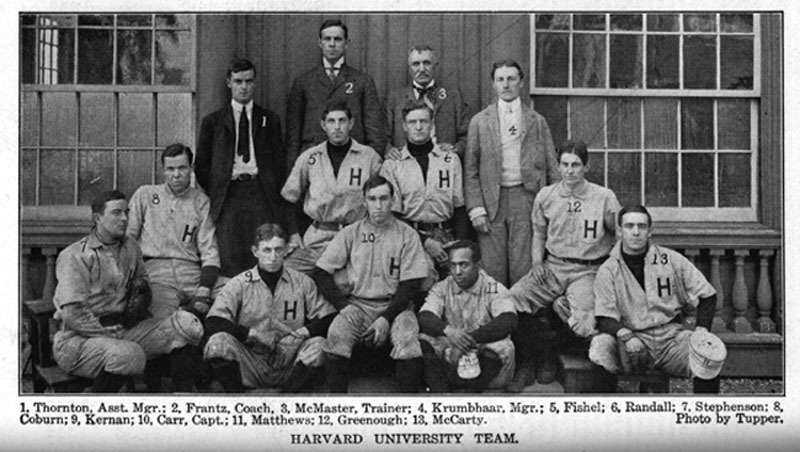 Harvard University Baseball Team, 1904. William Matthews (no. 11, front row) was one of a small number of Black students attending majority white institutions in the early 20th century. Born in Selma, Alabama, he attended Tuskegee Institute for four years before moving north to further his education, first at Phillips Andover, and then at Harvard. Matthews as an outstanding athlete and a standout at the shortstop position, this at a time when Harvard’s was arguably the best college baseball team in the nation. After completing his undergraduate studies, Matthews earned a law degree from Boston University. He went on to become special assistant to the U.S. district attorney in Boston, and eventually to hold a position in the Justice Department, under Calvin Coolidge. For more on William Matthews and his battle to integrate professional baseball, click HERE. I just love the education I receive each time I visit your blog. I’m new to blogging and wordless wednesday is my first post. I’ll add you to my blogroll. As a lifelong student of history, I found this very interesting. Thanks for sharing it and thanks for visiting Spatter. This just brought all those very valuable conversations back. Thanks much for this. hagar’s daughter — so glad you stopped in. Yours is one of my favorite blogs, and with one of my favorite blog titles. Rev Joanne — thanks for adding me to your blogroll. I’m adding you to mine, as well. Welcome to Wordless Wednesday! Keith — Thank you for your comments; and thanks for mentioning your uncle. Such an amazing story. I would love to feature him on my blog, or at least to list him on my timeline of Blacks in higher education (www.twilightandreason.com). Let’s get in touch. There we go a little food for thought. Good post. I’d be glad to get in touch and share what I know about my Uncle Monroe. He was actually my father’s best friend, so not uncle by blood, but he was always my Uncle Monroe. Feel free to email me anytime. My father’s Dad was Monroe Dowling and he was the first black to graduate from Harvard Business School (see link: http://institutionalmemory.hbs.edu/timeline/1931/monroe_dowling_becomes_first_black_student_to_graduate_from_hbs.html). I have a copy of his picture from his yearbook. If anyone has any stories to share about him I would appreciate it.